The celebrated Related Group maintains a thoroughly proven and impeccable 25 year track record of astonishing and highly respected condominium developments in their portfolio. The Apogee in South Beach will arguably become their most eminent and marvelous creation to date in an already tremendously extensive array of notable developments later this winter season. It will proudly stand apart from its neighboring buildings by featuring 22 stories comprised of just 67 highly coveted and anticipated units. 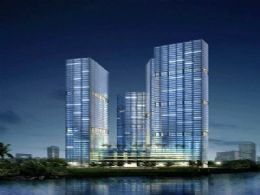 Apogee will boast an architectural design by famed Sieger-Suarez and within its posh interior you’ll find a lobby and common areas designed by the globally renowned interior design firm Yabu Pushelberg. Among its impending amenities and features will be an open air party pavilion, cutting edge fitness and spa facility, and a collection of art pieces by celebrated Miami artist Jose Bedia. Furthermore, Apogee will be equipped with bleeding edge Lifestyle brand technology, offering the absolute latest in residential comfort and convenience such as automatic blinds and keyless fingerprint residence access. The 67 residences at Apogee, available in three to four bedroom floor plans that reach up to 6000 square feet, will be equipped with a number of sound repressing enhancements designed to offer you the utmost peace and quiet. Ceilings will soar ten feet and the terraces will be a mind-boggling eleven feet wide. Additionally you’ll find wireless lighting systems and an interactive touch panel providing easy access to Apogee’s numerous services such as valet. The luxurious residences will also feature kitchens with the most high end Dellacassa brand cabinetry. Bathrooms come with Dornbracht brand showers and baths. 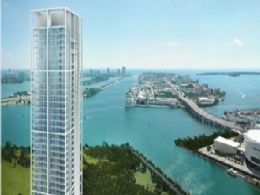 Not only will Apogee residents be able to boast about having the privilege of living in one of South Florida’s most exclusive condos, they will also be able to indulge in all the excitement available at Lincoln Road and Ocean Drive or sail across the vast Atlantic by taking out a vessel at the Miami Beach Marina. Within walking proximity to Apogee are some of South Beach’s most popular restaurants such as the delectable Joe’s Stone Crab, a long running resident favorite for a number of years and a required dining experience for tourists.